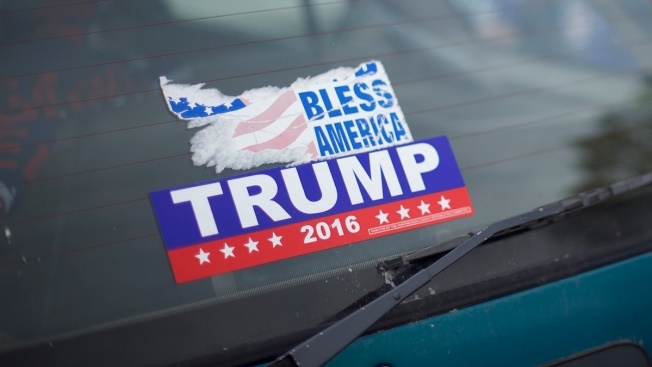 In this Oct. 22, 2016 file photo, a Donald Trump campaign bumper sticker is seen on a car. A motorist accused of intentionally hitting another vehicle after becoming enraged by a bumper sticker for President Donald Trump has pleaded not guilty to assault with a dangerous weapon. Chloe Wright appeared in court in Barnstable, Massachusetts, on Monday. The 25-year-old also faces charges of vandalizing property and leaving the scene of property damage. The Cape Cod Times reports a man told police he was stopped at a red light on June 30 when the driver behind him began honking the horn. At the next light, the man told police the driver called him a racist and other names after asking if he had voted for Trump. The man told police the motorist rammed his door and hit the side of his vehicle as she drove around his car.